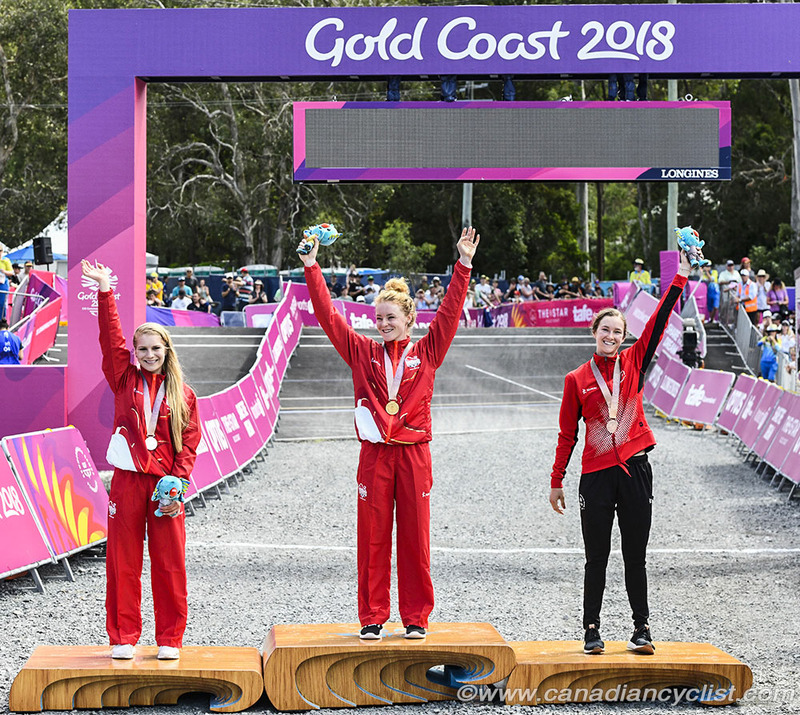 Canadian cyclists took their third medal of the Commonwealth Games on Thursday, with Haley Smith winning the bronze medal in the women's Mountain Bike competition at Nerang Mountain Bike Trails, just west of Gold Coast. Emily Batty was fourth and Leandre Bouchard sixth in the men's race. The 4.6 kilometre course took riders on two long loops out and back from the start-finish at an outdoor velodrome. Not as technical as World Cup circuits, the course was fast and flowy. 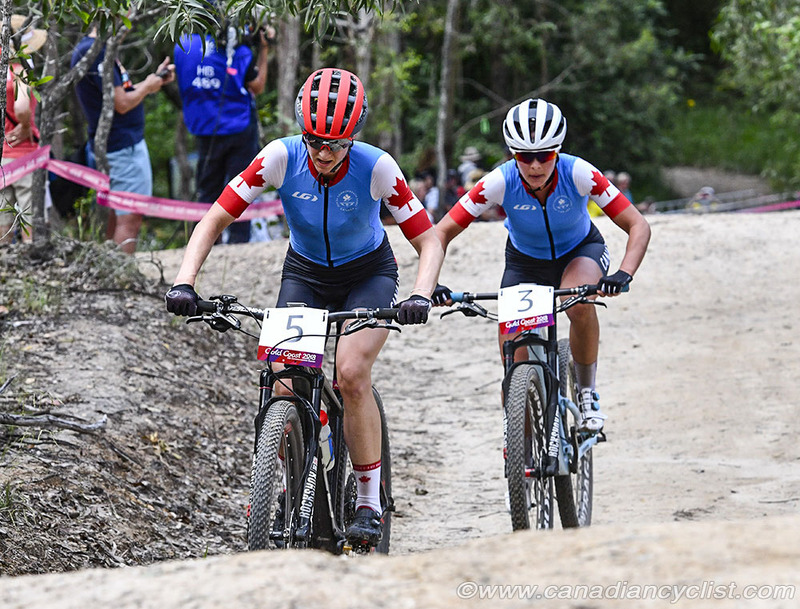 The women's race saw Smith challenge at the front in the first half lap with English riders Annie Last and Evie Richards, followed closely by Canada's Emily Batty. However, Smith made a mistake on one the steep climbs, losing multiple spots, and had to work her way back from seventh. Batty was sitting in third by Lap 2, 45 seconds behind the two English riders. Smith steadily moved up to join Batty by Lap 4 and dropped her team mate on the next lap, but the two front spots were out of reach. Annie Last took the gold medal ahead of Richards after dropping her team mate at the halfway point of the race. 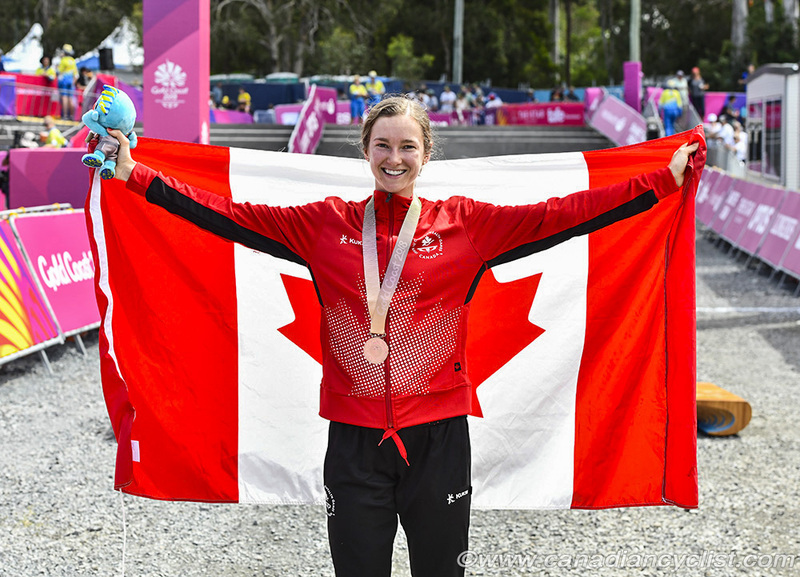 "I don't know how to feel yet," said Smith, "I did not expect to win a medal today. I didn't have a lot of expectations for a specific performance when I came here. I struggled this week with believing that I deserved to be here, so my Games experience was about feeling the atmosphere and being confident in myself and my preparation. So when I got to the start line, all I wanted to do was race and it worked out. The first climb has three technical up sections and I think everybody had problems at least once during the race, but unfortunately mine was on the first lap. So Annie and Evie got a gap there and I fell back to about seventh. From that point on, I was just chasing. I kept my head down and kept at it, and it played out." "Emily is someone that I have an incredible amount of respect for and I really look up to her as a rider and a person. On the race course it's not about beating a specific person, just getting the best out of myself. I was just focussing on driving the climbs as hard as I could, and it just so happened that I passed her." "They are very different events; this is a major Games, but it is a smaller field. There are some top international performers here, and I didn't really know what to expect of myself, and I don't know I can compare it to a world championships. But I'm really happy, and this is something I will have for the rest of my life. I feel very proud and humbled, and fulfilled." 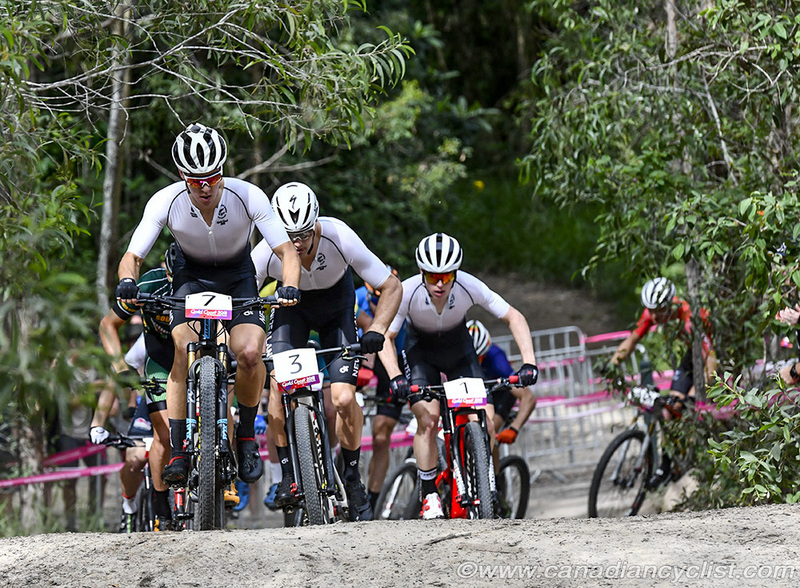 "I got held up on the first lap when we got bottlenecked going into the singletrack," said Batty. 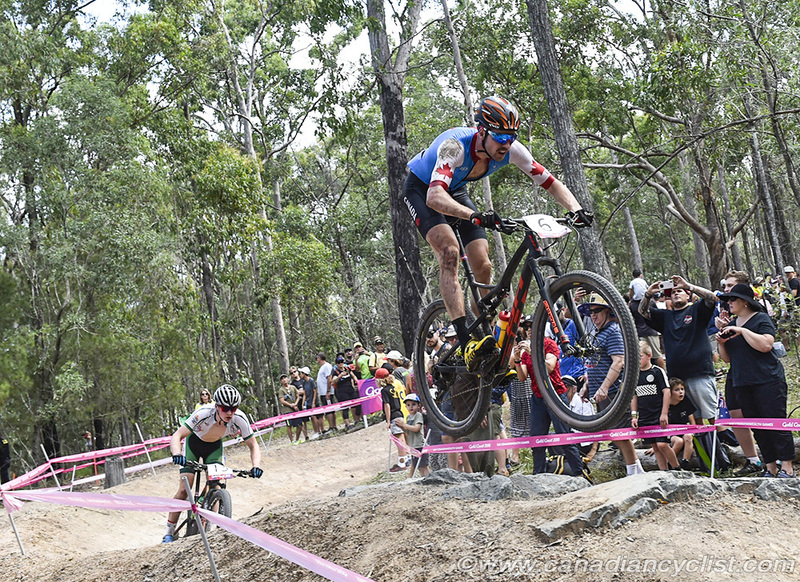 "The first two riders were able to get a big gap, and I did a big effort to try and bridge across halfway into the first lap, and right up to the third lap. Unfortunately, on the fourth lap I paid for that effort. Haley caught me and got the bronze, and it was good to see her on the podium. It wasn't what I was hoping for, but it's still early in the season for me. I hope to be firing on all cylinders by the main part of the season at the end of May." 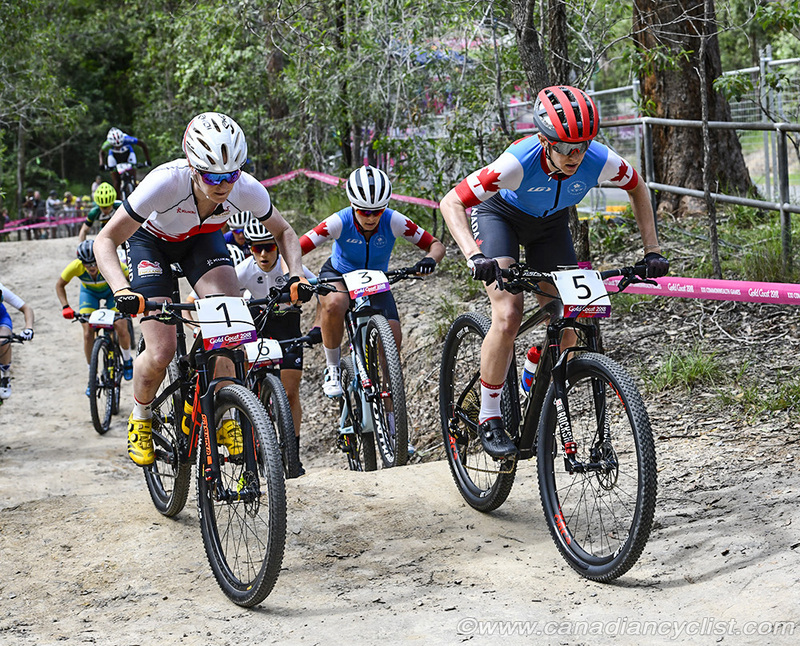 Dan Proulx, National Mountain Bike Coach, said "It was a strong race for our women; the start was pretty challenging with lots of traffic and a tight climb. If you missed it, it was a game changer. I'm proud of the girls for fighting back and they rode the last quarter of the race strongly. It is early, early season for us, and we have a lot of work to do as the World Cups start." Last, who last season won her first World Cup, said "It was absolutely amazing. I'm still waiting for it to sink in. The race went really smoothly. My legs were good and it all just came together. I'm really happy with the race. During it you never know how you're feeling and how it will play out in the end, but I just put absolutely everything into the race and focused on my own performance. I wanted to start out in the mix because a lot of it is single track, it's hard to pass people. I wanted to get in a good position at the start, and luckily I was able to stay up the front, which is good because you can ride your own race." 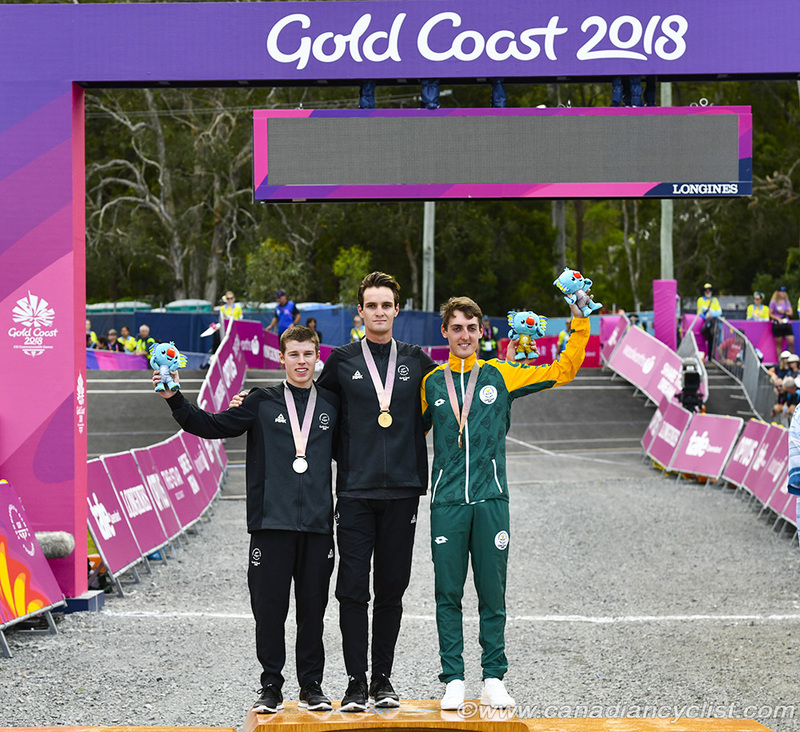 In the men's race, the New Zealand duo of Anton Cooper and Sam Gaze quickly opened a gap on the field with Alan Hatherly of South Africa joining them. Bouchard got caught up in traffic, missing the front group but managing to bridge up to the chasers. He tried to attack a few times but could not open a gap on English rider Frazer Clacherty, finishing sixth in a sprint just behind Clacherty. After Gaze suffered a flat coming into the last lap, Cooper, the defending champion, attacked, dropping Hatherly. Gaze quickly motored passed Hatherly to join his team mate at the front and then won the two-up sprint for the gold medal. "My start was so-so," said Bouchard, "I was stuck behind some other riders on the first climb, so I lost contact with the front group. But I kept charging and was able to make contact with the chase group. I tried to attack on the third lap, but there wasn't enough space to pass and I crashed. I kept pushing to try and get in medal contention, but the gap was too big. I attacked on the last lap, but it wasn't enough to get rid of the English guy and he won the sprint for fifth. It was a great experience to be here with the national team and represent Canada." Gaze, who is having a strong start to the season after winning the first round of the World Cup last month, said "I can't believe I won gold. The feeling is just unimaginable. There was lots of bad luck going around with people having stacks [crashes] and punctures, so I'm really happy with today's result. I lost about 15 seconds [with the flat] but I was lucky to get it back on that last lap. I just had to believe in myself and keep telling myself I could do it. I knew I needed to close that gap because if I didn't, I wouldn't win the race. 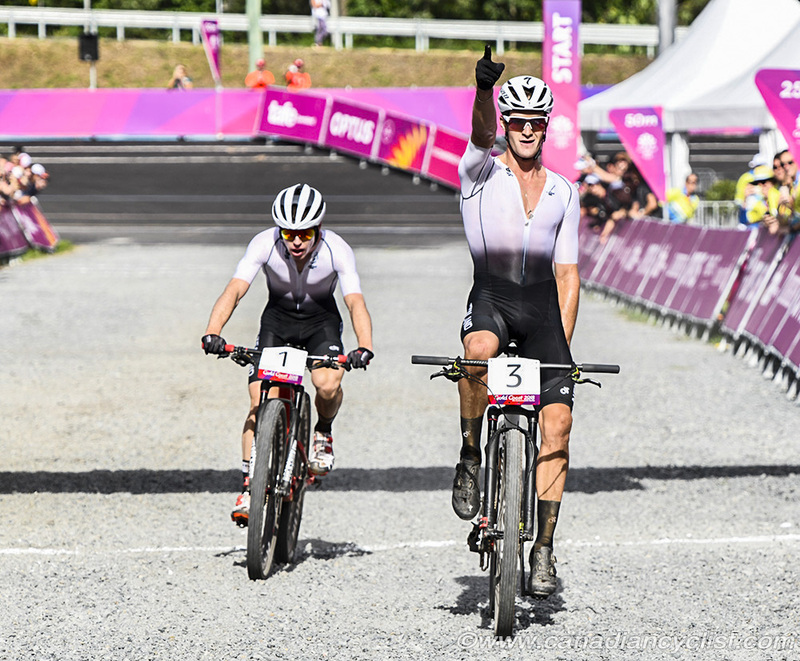 Although at that stage, all that was on my mind was just getting back on my bike as quickly as I could, and I'm really grateful that I got the job done."